Description: Platform shooter with top-down sections mixed in. By Sunsoft. Box Text: Mega Graphics! Mega Action! The New York sewers were never like this! You've fallen down a hidden manhole into a world of creatures so terrifying they'd scare the rats away. You can panic and perish, or blast your way through an endless maze of tunnels, searching for the secret passages to your escape. And that's the easy part. Because the Masters of the Caverns lay waiting - prehistoric creatures so powerful, so gigantic, they literally fill your screen! 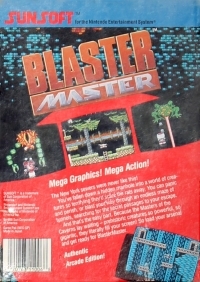 So load your arsenal and get ready for BlasterMaster. 01-30-2014 badATchaos Box Text Mega Graphics! Mega Action! The New York sewers were never like this! You've fallen down a hidden manhole into a world of creatures so terrifying they'd scare the rats away. You can panic and perish, or blast your way through an endless maze of tunnels, searching for the secret passages to your escape. And that's the easy part. Because the Masters of the Caverns lay waiting - prehistoric creatures so powerful, so gigantic, they literally fill your screen! 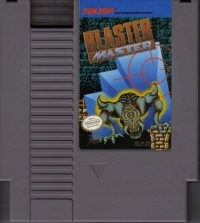 So load your arsenal and get ready for BlasterMaster. Authentic Arcade Edition! 01-29-2014 badATchaos Description Platform shooter with top-down sections mixed in. By Sunsoft. 01-29-2014 badATchaos Box Text Mega Graphics! Mega Action! The New York sewers were never like this! You've fallen down a hidden manhole into a world of creatures so terrifying they'd care the rats away. You can panic and perish, or blast your way through an endless maze of tunnels, searching for the secret passages to your escape. And that's the easy part. Because the Masters of the Caverns lay waiting - prehistoric creatures so powerful, so gigantic, they literally fill your screen! 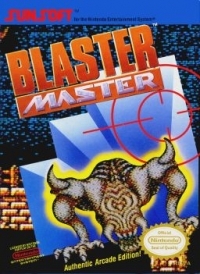 So load your arsenal and get ready for BlasterMaster. Authentic Arcade Edition! This is a list of VGCollect users who have Blaster Master (oval seal) in their Collection.